Suppose you’ve been out with friends for the evening. You’ve had a couple of drinks, and while you might be flirting with the legal limit, you feel in control of your senses for the time being. Against your better judgment, you decide to get behind the wheel. Halfway home, you crash into another vehicle at an intersection you’ve passed a hundred times before. You don’t know where the other car came from, but you also don’t remember actually driving to this intersection before the crash happened. You panic. Perhaps you’ve been arrested for DUI before, and you don’t want the police asking questions. You decide visually that (probably) no one was hurt, so without getting out of the car—you drive off. Imagine that you’ve spent some time at a bar or at a party with friends. You’ve had a couple of drinks, but you don’t feel particularly tipsy—so when you leave, you get into your car thinking you’re safe to drive home. Your car, however, doesn’t seem to cooperate. Either it refuses to start, or when it starts, you can’t put it into gear. The car sends you a message, either audibly or by text, that your blood alcohol content is too high, and offers to call a taxi for you. If you think this scenario sounds like a sci-fi movie set decades into the future, think again. The technology already exists to generate this level of DUI prevention, and within a few years we may even see cars equipped with this tech entering the mainstream. In fact, over the next ten years we may see emerging technology radically reshape the ways in which DUI is prevented and/or enforced. Let’s explore a few examples. However, beginning in the 1980s, some elements of pop culture began going on the offensive against these permissive attitudes toward DUI, shining a light the gruesome statistics of injury and death that DUI frequently caused. As a result, public opinion has shifted dramatically, and our books, movies, songs and TV shows have begun reflecting a different view. Even so, despite all the PSAs, ad campaigns and highway warning signs, DUI remains an ongoing issue in our world. Over this post and the next, we’ll examine DUI as reflected in popular culture then and now, looking at what our entertainment media has gotten right, where it’s missed the mark and where we might go from here. When you get pulled over by police and asked to perform a field sobriety test, the issue of DUI becomes very real to you and affects you directly. However, sometimes it helps to put the topic in a greater context. How has DUI enforcement changed over the years? How does drug DUI now come into play with the legalization of pot in California and other states? Are the current laws and technologies doing a good job in deterring people from making a mistake? If not, what can we do better? To explore these questions, let’s take a look at some the most significant DUI stories from the past decade—not just high profile cases like celebrity arrests, but stories that help paint a picture of different aspects of the issue—to see what we can learn from them. We’ll start with a recent news story that actually discusses an eye-opening trend over the past decade. Getting arrested on suspicion of DUI is not a pleasant experience. Resisting the police, however, almost always makes a bad situation worse. As a case in point, let’s look at the recent charges against 48-year-old actor Vince Vaughn. On the early morning of June 10, Vince Vaughn was stopped at a DUI checkpoint, where he was subsequently arrested. Last month, according to the Hollywood Reporter, Los Angeles County prosecutors announced Vaughn was facing three misdemeanor charges: driving under the influence of an alcoholic beverage, driving with a blood alcohol level of .08 or higher and refusing to comply with a peace officer. One of the most common tactics utilizes to try and dissuade people from DUI is to describe what could happen if someone gets behind the wheel while intoxicated. In reality, we can learn just as much (if not more) from things that actually did happen during DUI incidents. Quite often the events are completely unpredictable and frequently disastrous. We believe these true-life stories hold lessons for us all, so let’s take a look at a recent compendium of rather crazy stories of DUI that have happened in recent memory to see what we can learn from them. What Is the Driver Alcohol Detection System for Safety (DADSS)? In almost every industry and field, technology continues to disrupt old systems and open up new pathways for advancement. None more so than in the field of law enforcement, where researchers, inventors and tech geniuses are working on more advanced tools not only to enforce DUI, but also to prevent it. 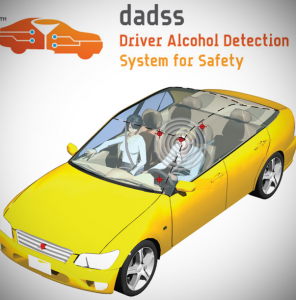 Perhaps the most promising of these initiatives is the Driver Alcohol Detection System for Safety (DADSS), a federally funded research program developing a technology that will automatically prevent an intoxicated driver from operating a motor vehicle. Intoxication occurs because our bodies are unable to metabolize alcohol at the rate at which we drink it. As a result, most of the alcohol is absorbed directly into the bloodstream through the walls of the stomach and intestines. This blood alcohol content (BAC) can actually be measured by the amount of alcohol on our breath, and even through the membranes of our skin. Let’s start by acknowledging the obvious: No one begins with the express intention, “I’m going to get arrested for DUI tonight.” Although sadly, some people don’t care one way or the other, the average person doesn’t set out with an intent to drive under the influence. Usually, a DUI arrest happens as a result of bad judgment, bad choices, unforeseen circumstances or a combination of these things. Unfortunately, once you’ve been arrested, you can’t hit the “rewind” button on the bad choices that led to that moment. Additionally, if your arrest ends in a conviction, the consequences may be long-lasting and permanent. “An ounce of prevention is worth a pound of cure,” as the saying goes—so let’s discuss a few of the ill-advised ways people set themselves up for DUI and how to avoid them. Humanity’s relationship with alcohol has always been a complicated one. Even before we had vehicles to operate—even before DUI became a significant risk—human beings have enjoyed the immediate effects of alcohol consumption only to “sober up” to extended risks like addiction, health issues and death. One key ingredient to avoiding DUI for the long term is understanding how alcohol interacts with your body. Most of us know that alcohol can damage the liver, but that’s not the only danger. Let’s look at 12 other facts about how the body responds to alcohol that you might not have realized. 1. Alcohol in Moderation Can Actually Be Good for You. Are you surprised that we started with something positive? As Time reports, multiple studies have indicated that moderate amounts of alcohol may actually provide a few health benefits, decreasing our risk for heart disease and possibly even helping us live longer. This information comes with some caveats, though, because every human has a different tolerance level for alcohol—meaning the amount considered “moderate” may be different for each of us. It also doesn’t negate some of the other health risks associated with alcohol. And of course, even “moderate” drinking can raise your blood alcohol content above the legal limit, so you should still avoid driving after indulging.